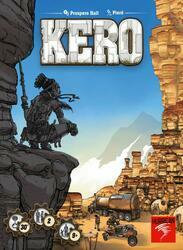 KERO is a 2-player strategy game, in which your clan must be smarter and faster than the opposing clan to win. It is a game of cards and dice, with the placement of explorers and a majority count on the territories to be conquered. In KERO, you will have to make wise choices in a limited time, as you will roll dice under the pressure of an hourglass (your tank truck filled with kerosene). Since you can optimize the number and type of dice to roll, your strategy will be successful if the odds are on your side! How to win? You only have 3 sets to win. You must roll your dice and collect as many resources as possible using as little KERO as possible from your tank truck. You must send Explorers to the New Lands to conquer them. If you are in the majority at the end of the round, you win them. You meet Tuareks on your way who are always ready to help you. In general, they are nice, but it is better to have them on your side. Manage your KERO, collect new resources, explore New Lands and save your clan! Contents of the box : 1 game board, 2 tank trucks, 8 dice, 14 wooden explorer tokens (7 per clan), 1 deck of 39 cards, 12 new earth tiles, 18 Tuarek tiles, 27 Jerrican tokens, 10 power tiles.